I understand, at least I have been told, that there is a discussion going on, on one of these on-line chat rooms that deals in such things, about the first occasion in history when armoured cars engaged one another in battle. Apparently they have come to the conclusion that the first time it ever happened was near Aleppo, in northern Palestine towards the end of the war. I remember having read something about this so I thought I had better read more, to see how good my memory was and to bring myself up to date on the facts, such as they were. I found two sources. One was in the book ‘War on Wheels’ by Captain C R Kutz of the United States Army, published in 1941, the other was in Part II, Volume 2 of the British Official History ‘Military Operations Egypt & Palestine’ by Captain Cyril Falls and published by HMSO in 1930. Both tell the same story, as you would expect, although Captain Kutz has added a few juicy details to his in order to tell a good story, the author of the Official History clearly doesn’t see the need to do that. A typical group of Rolls-Royces in the Middle East (header image), three at least with the upper panels of the turrets removed to reduce the heat. Each car was equipped with a single Vickers machine-gun. A German Ehrhardt, but not in the desert. A big, stately looking car with Maxim machine-guns sprouting out everywhere but you can see how bullets from a Rolls-Royce could have entered the turret. So what happened? 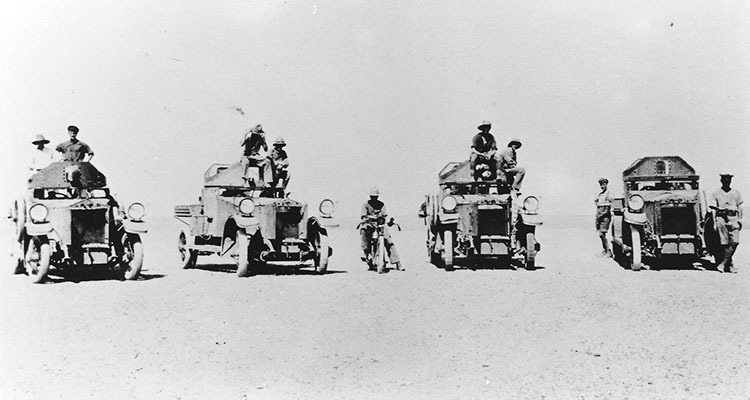 Well it appears that three Batteries, the 2nd, 11th and 12th along with a couple of Ford T based Light Car Patrols were operating with 15th Cavalry Brigade near the town of Hama when they received a report from an aircraft of a Turkish transport column, escorted by an armoured car, heading north out of Khan es Sebil on 22 October 1918. The armoured cars, which would have been Rolls-Royces, immediately set off to give chase but the roads were rough and stony so progress was slow. I remember reading about this and being more anxious to confirm the identity of the German armoured car than anything else. Whether it was the first armoured car vs. armoured car action of the war was something that didn’t interest me very much at all. Mind you I was surprised to read that the German armoured car made better speed over this rough ground than the British Rolls-Royces which were renowned for their speed. 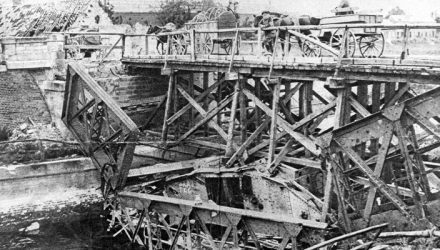 According to Kutz this was because the German vehicle, which he says was a big, lumbering Model 1914 type had iron rimmed wheels which coped with the stony road a lot better than the British cars which had pneumatic tyres. Kutz says that when the British caught up they were involved in a running fight for about a mile or two before the German vehicle was stopped and surrendered. 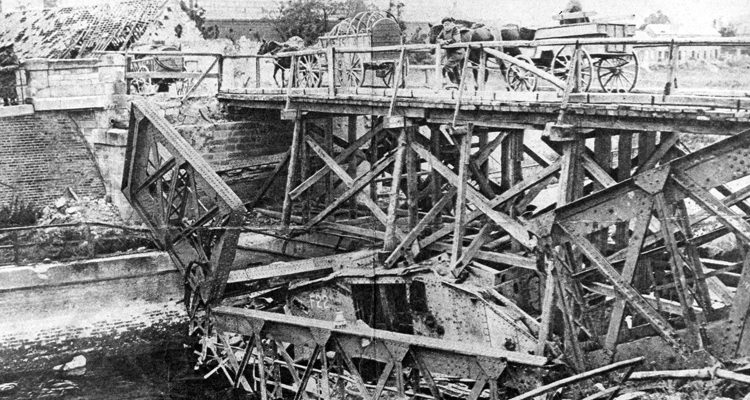 Apparently although the armour on the German car was proof against machine-gun fire the British weapons penetrated gaps in the turret mounting and wounded the crew. The lorries all got away, except for one which was shot up by a Model T Ford armed with a Lewis gun, or broke down, depending upon which book you read. The Official History doesn’t mention the aircraft but says that the information about the Turkish column came from local inhabitants in Hama. 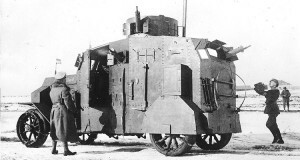 The Germans had three types of armoured car in 1914, an Ehrhardt, Daimler and the massive double ended Bussing. They were all quite big, and all had four-wheel drive but we still don’t know which version was then operating in the Middle East. Upon further consideration the most likely type of armoured car would be the Ehrhardt. Of the three types mentioned above only the Ehrhardt continued in production, up to 32 having been built by the end of 1917. 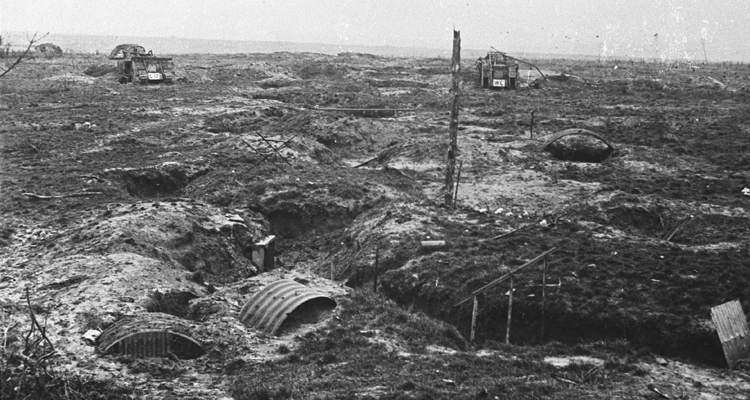 Another type mentioned as a possibility is the Mannesman-Mulag of 1916, but only one of these is believed to have been built and in any case it did not have a turret or any fixed weapon mounting and the account of the action particularly refers to the turret being struck by rounds from the British cars; the Ehrhardt had a machine gun turret. 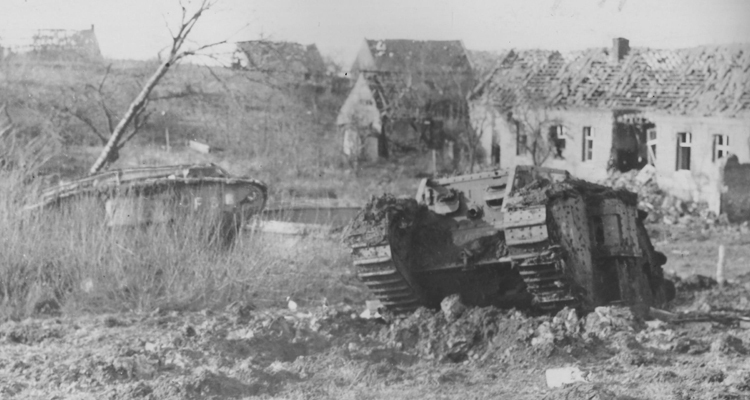 It always struck me as a bit unfair that one lone German armoured car was attacked by up to a dozen Rolls-Royces, even if they were half the size, but it is no wonder that it surrendered. Apparently, according to Kutz, there is a first-hand account giving details of the German car in a book entitled ‘Allenby’s Final Triumph’ by W T Massey which I need to see. As to whether this was the first (and possibly only) action involving armoured cars on both sides I don’t know and am not really bothered. I should have thought that such an action would have taken place earlier, possibly more than once, on the Russian front where they had any number of armoured cars. 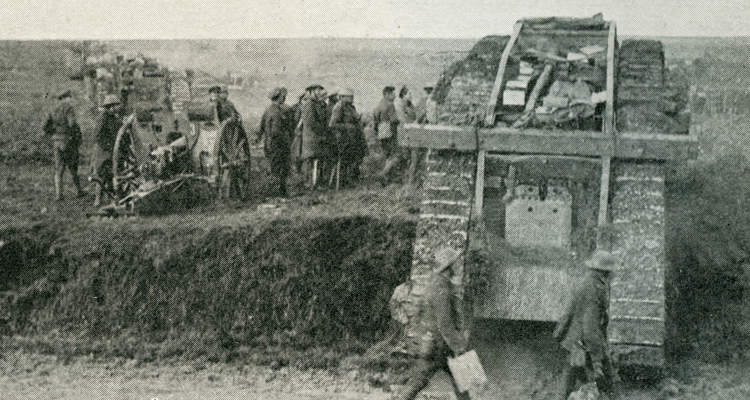 However if you are prepared to stretch the description of what constitutes an armoured car somewhat then an action by Commander Samson, in Flanders very early in the war should qualify.